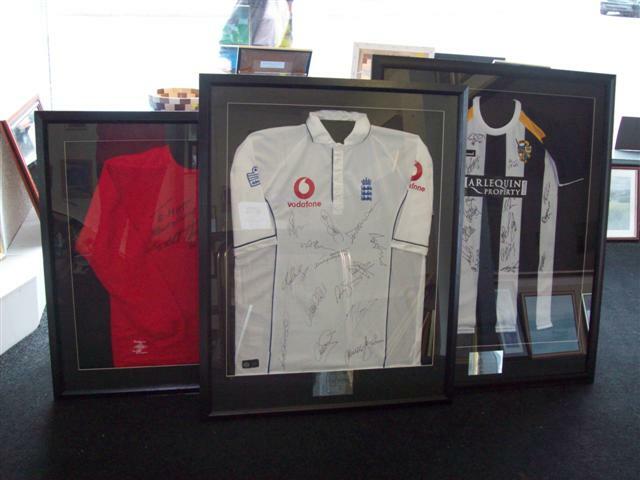 All Shirt Framing is most certainly NOT Equal....!! Grab a cuppa and a biscuit - It's a long read! 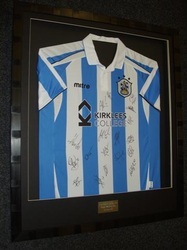 Where do you start as there are a considerable amount of framers advertising football shirt framing services,many suggesting that they are specialists in the framing of shirts - even DIY ready made standard size shirt frames are available in order for you to self frame your own shirts? 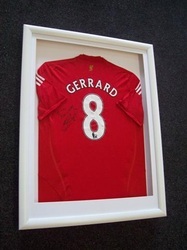 In fact some framers that offer a shirt framing service simply purchase DIY ready made frames online for a song, then simply insert your shirt, tape it down, and sell it on as bespoke.The problem with this, is that if you are serious about preserving the value of your signed shirt, such framing processes can cause irreversible damage, as quite often your shirt is attached within the frame possibly by staples, and more likely with strong adhesive tapes.At the very least your shirt will be flush up with the glazing possibly causing mildew and mold issues later on. 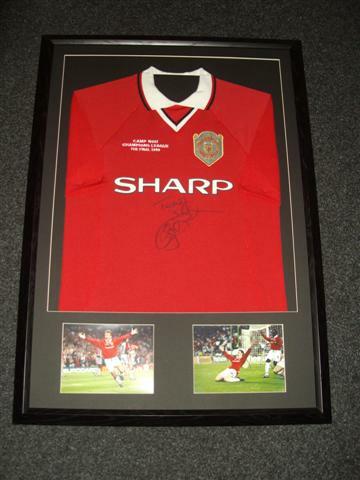 But anyway, why squeeze your expensive prized shirt into a ready made standard frame not really suitable for the job, when we can professionally custom bespoke frame your shirt for you using our fully reversible framing process which serves to protect your treasured shirt, and more than likely at a lower price than what it costs to purchase a standard sized ready made frame available online or in the high street? 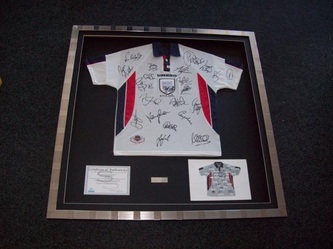 Some framers suggest that a shirt cannot be professionally framed for under £150.00 although we professionally frame shirts day in day out for much less than this. 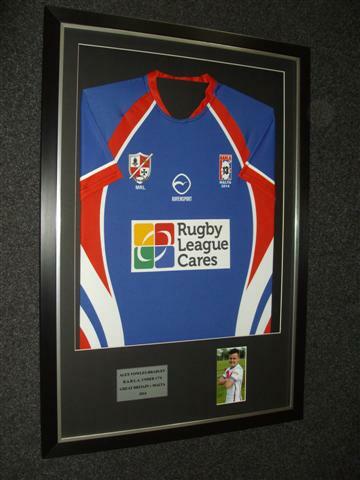 Find out how we frame all sports and T shirts so well at such low cost here. Your search is now over. 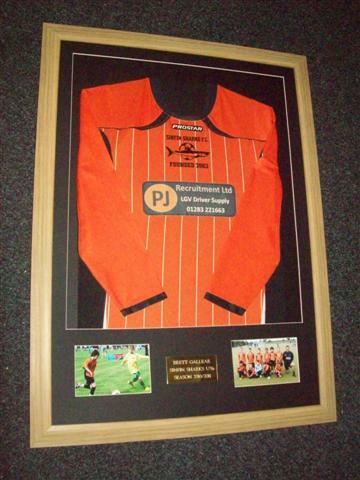 You have come to the right place for specialist professional sports shirt framing - and as usual simply click on any image that isn't already large to enlarge..!! 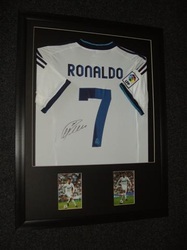 Framing a football shirt or any sports shirt for that matter is a skilled and time consuming exercise and in order for you to display your shirt at its best it is imperative it is done properly and professionally. 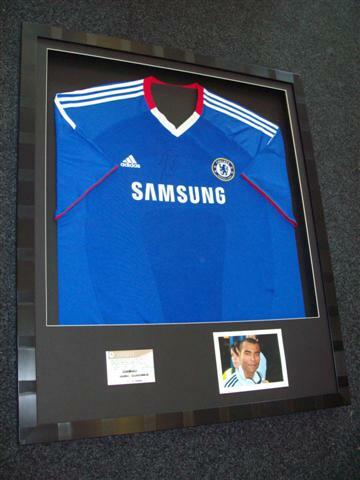 All shirt framing work undertaken by Discount Football Shirt Framing is totally and fully reversible, is custom manufactured by skilled staff using specialist industry leading techniques and top quality products and equipment. 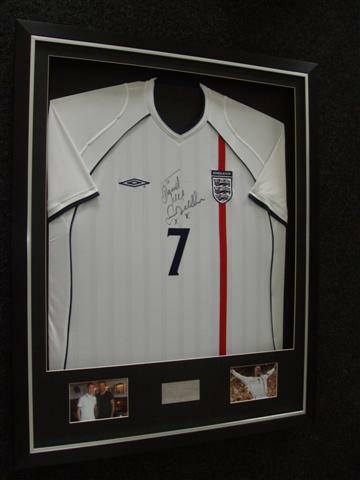 We craft the frame to fit your shirt for a perfect result. 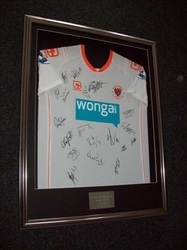 Discount Football Shirt Framing is a long established picture framing business with a high street retail outlet situated in Blackpool specialising in the framing of football shirts and offering professional bespoke framing services to private and corporate clients,picture framers and memorabilia retailers throughout North West Lancashire Cumbria and Yorkshire. 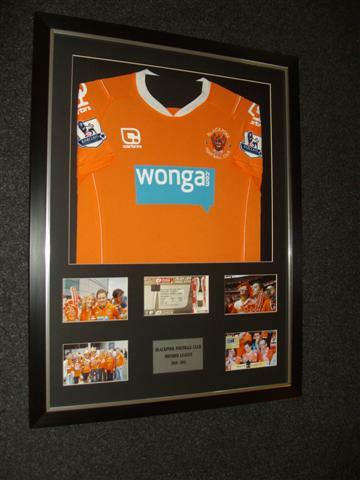 We offer a high quality cost effective discount picture and football shirt framing service to both the public and trade alike, with all work completed in house in our fully fitted workshop by skilled staff, using quality products and specialist shirt framing techniques. 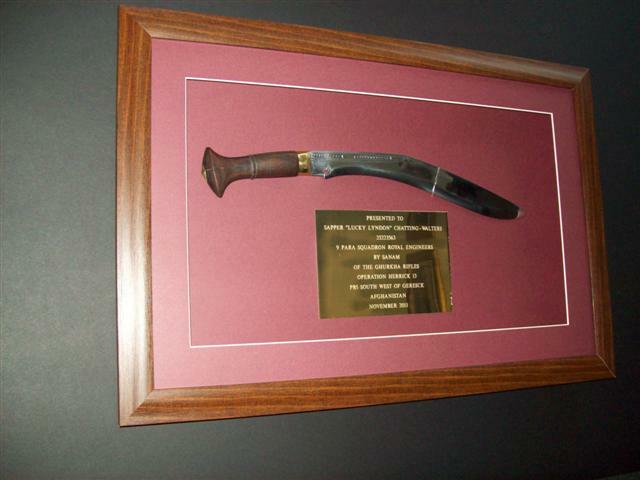 Customer satisfaction is of prime importance and is the mainstay of our business and if we say we will do something - we do it. 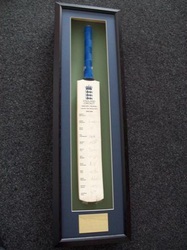 Its quite simple really - ''we do what we say on the tin''..!! 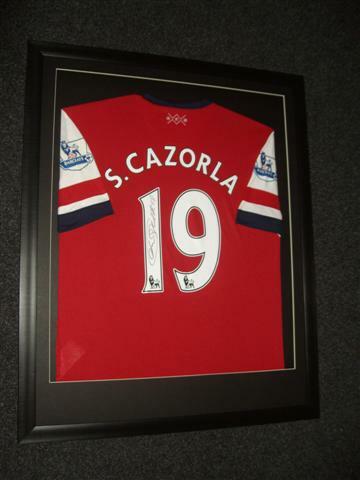 Right - You may be asking yourself - How do I frame a football shirt? 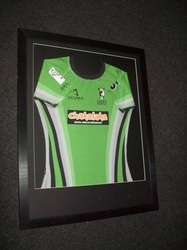 OK- So where do we begin when framing a football rugby t shirt or sports shirt - What exactly do we do and why do we believe we set the standard for others to follow? All football shirts are carefully arranged (there are a variety of arrangement styles from which to choose) with either the front or the back on show (dependent on customers requirements) and attached to mount card. 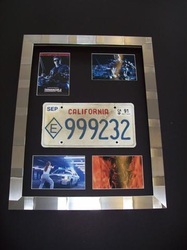 Please be aware that the mount card we use is acid free PH neutral and is generally Slater Harrison Colourmount or Daler Rowney which is manufactured to exceed the strict standards laid down by The Fine Art Trade Guild. 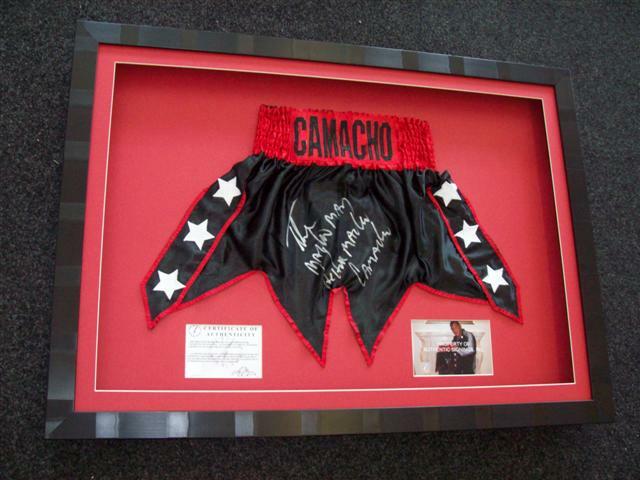 Our method of framing also covers that pesky collar tag that normally says "Made in China" - unless of course you wish to keep it on show! 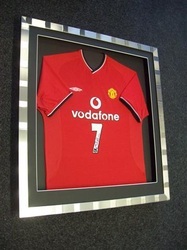 Discount Football Shirt Framing utilise the best methods to frame and protect your shirt. We believe we are the best, the most cost effective and one of only a few specialist bespoke framers that are aware of how to frame a shirt properly in order to preserve its future value. 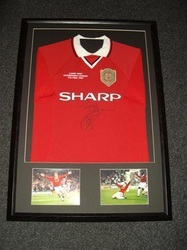 Not to be confused with, or in no way shape nor form be compared to other shirt frame offers elsewhere, where the shirt frames are much smaller and the shirt is crammed in to a ready made unsuitable frame like Ebay or other framers etc. We are custom bespoke framers and manufacture each frame to suit the shirt. 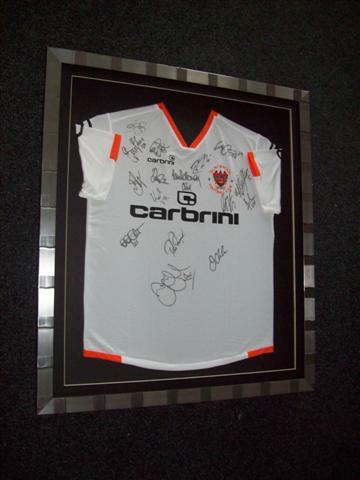 Our shirt framing is to conservation standard, which means it is fully reversible and causes no damage to the shirt being framed whatsoever. 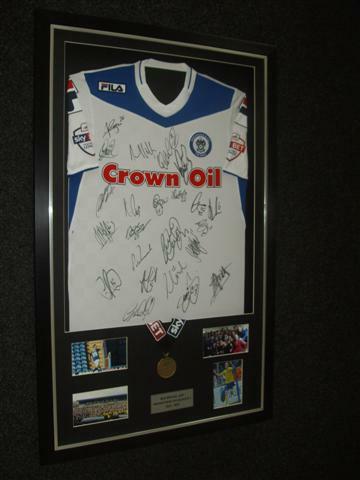 Our framing techniques preserve the value of your valuable signed shirt. 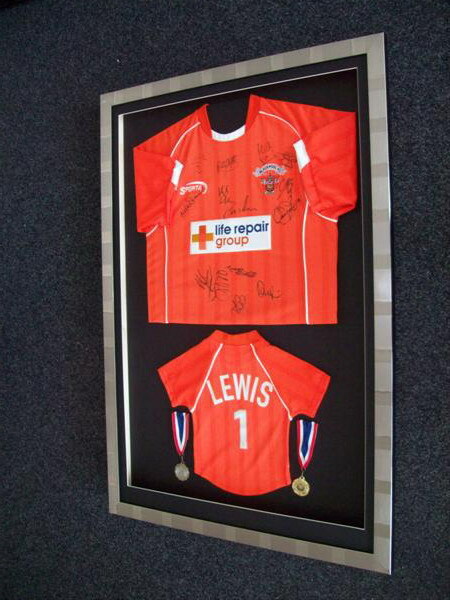 Generally speaking a properly and professionally framed sports shirt can be worth six times as much when complete. 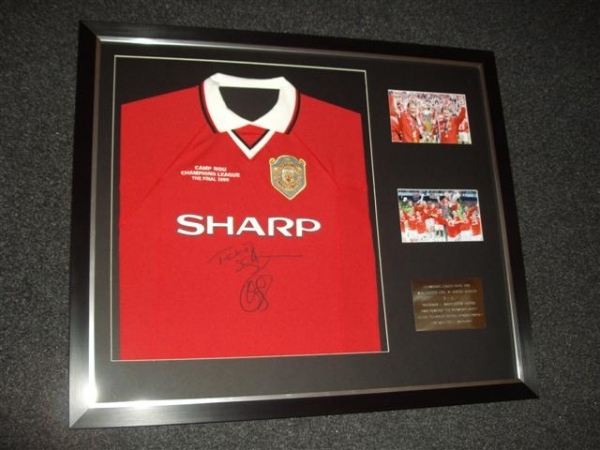 We use either deep rebate frames or standard frames whereby a bare faced wooden shadow box is constructed into which the mounted football shirt is placed and secured in a manner that prevents the football shirt dropping moving or sagging. We do NOT use staples nor glues nor tapes to secure the shirt that some budget framers or the less well informed may do, as this can damage the shirt in the short and long term. Staples rust due to dampness in the atmosphere and thus stain the shirt and it obviously needs no mention that great holes are left in the fabric due to over zealous stapling. Adhesives leave residues, which again not only stain the shirt, but can actually degrade the material as adhesive is acidic. 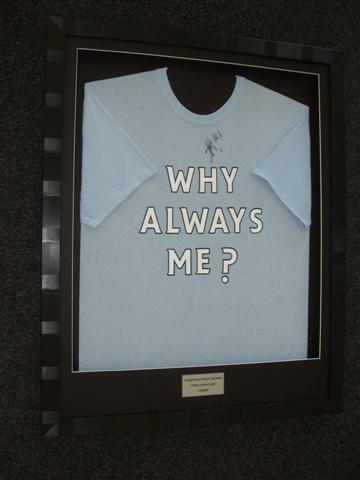 We use a special technique used in the clothing and embroidery industry, where a delicate but secure method of attachment is necessary. The purpose of the shadow box or deep rebated frame is that it serves to keep the shirt away from the glazing and also preserves and protects the football shirt. 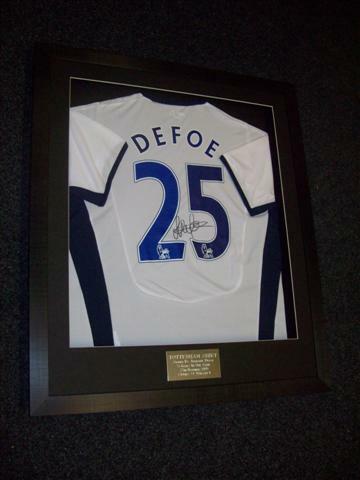 All frame mouldings we use are obtained from UK suppliers, are a perfect width for shirt frames (between approx 32mm and 50mm, so possibly wider than those provided by other shirt framers) and are of an excellent and consistent quality. 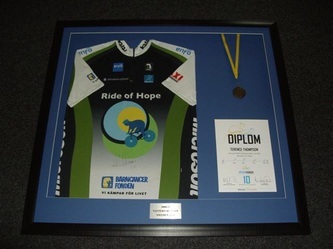 We do NOT use cheap frame moulding such as mdf wrap or similar as mdf wrap types of frames 'bubble and delaminate' over time and in the fluctuating heat and humidty experienced indoors. 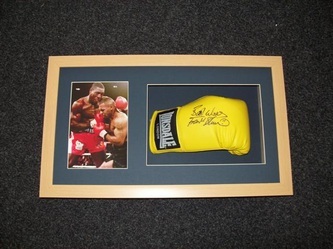 When including extras within the frame, such as, for example, photographs, plaques, football stubs, COA etc these can either be incorporated on the rear mountcard, or incorporated within the design of the front mount surround. The choice really is yours. 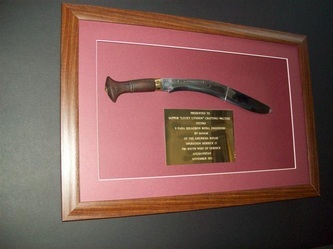 Where deep rebate frames are not used, the box is then attached to the individually manufactured frame moulding, finished off with a bevel cut mount and glazed using either glass or safety glazing depending on the completed products size and/or weight. 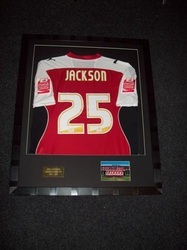 Diffused glass (non/low-reflective) which is normally utilised to minimise reflection should not be used in box framing, as it will make the view of any signatures on the football shirt less clear. 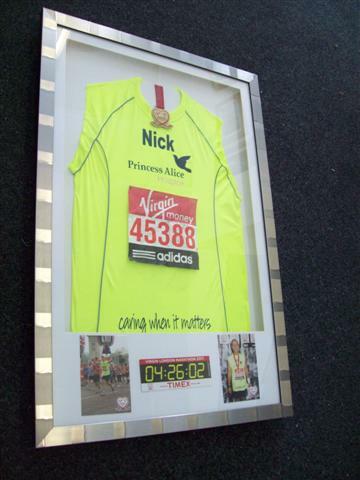 Such glass is better utilised within normal framing work, such as print and photograph framing, where its use is beneficial. The rear of the shadow box frame is then plated and secured with sturdy backing, then sealed with picture framers tape to keep dust and pollution out and also for a neat finish. 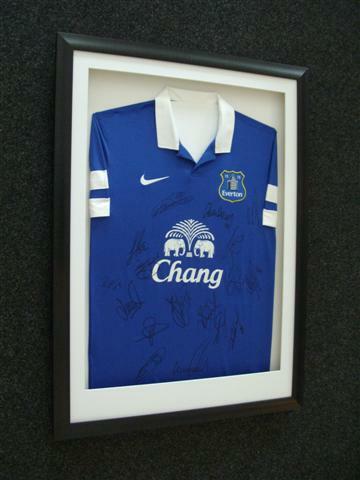 Dependant upon size and/or weight, the finished framed football shirt is strung ready for hanging. 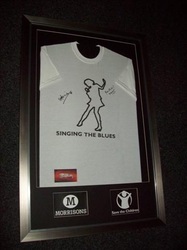 Alternatively hanging attachments are supplied in order for you to display the finished product on the wall. 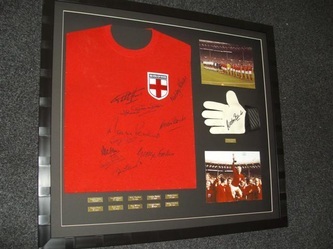 Additional items can be included with the framed football shirt such as photographs, ticket stubs, engraved plaques, certificates of authenticity etc, but be aware that if the shirt is framed fully on show, that adding extras greatly increases the overall size and weight. 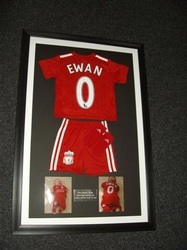 Generally speaking when extra items are to be included within the framed football shirt, then the shirt is arranged in the half folded style. 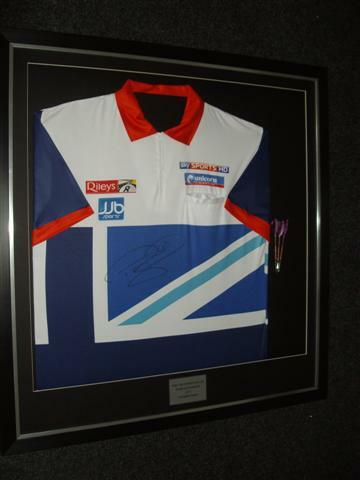 This however is dependent on where the shirt has been signed. 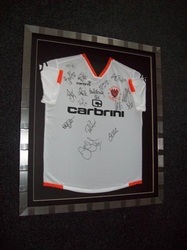 With regard to overall shirt frame dimensions and purely as a guide, a framed football shirt can be around 38 x 33 inches (970 x 840 mm) and moderately heavy, so please also make sure you have adequate wall space on which to hang or attach the completed shirt frame. A football shirt should always be framed in a manner that avoids the shirt touching the glass / glazing. This is why all the football shirts we frame are shadow box framed, or framed using deep rebate frames. This method not only protects and preserves the football shirt, but ensures it is displayed in a manner that looks both professional and pleasing to the eye, as you are looking into the frame as opposed to at it, thus giving the football shirt a deep "3 dimensional" look. 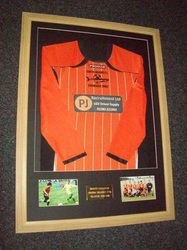 The end result is that your football shirt will look as though it is "floating" in the frame. 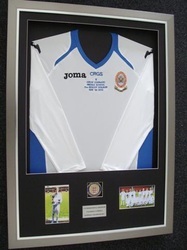 Further and in order to protect and preserve your shirt all techniques employed by us to frame your shirt are fully reversible and non damaging to the item. 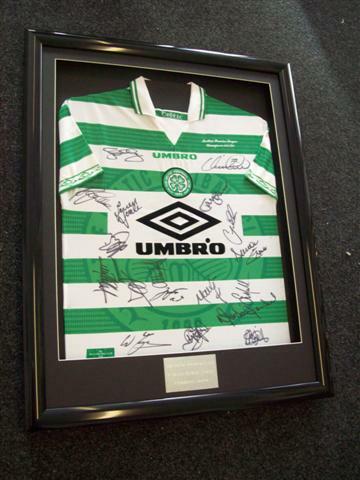 Numerous framers will "frame" a football shirt in a "standard" frame i.e. 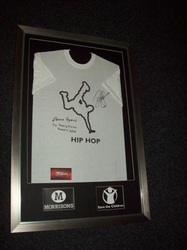 - like framing a print or a certificate. This means the shirt is pressed up against the glass, with the glass and the backing board around which the shirt would be wrapped, holding the shirt in place. 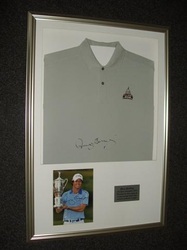 This can lead to moisture and mold problems as the shirt cannot "breathe" as air is not able to circulate. 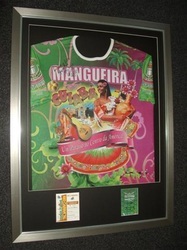 This method of framing a shirt is not best practice, not recommended,and is just one of the reasons why all football shirts framed by Discount Football Shirt Framing utilise shadow box framing techniques to avoid such issues. 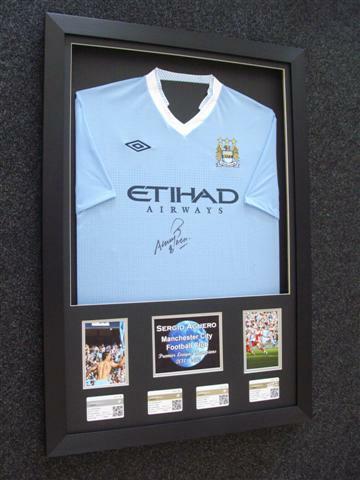 Yes, that is correct - every football shirt we frame incorporates shadow box framing or the use of deep rebate frames irrespective of pricing! 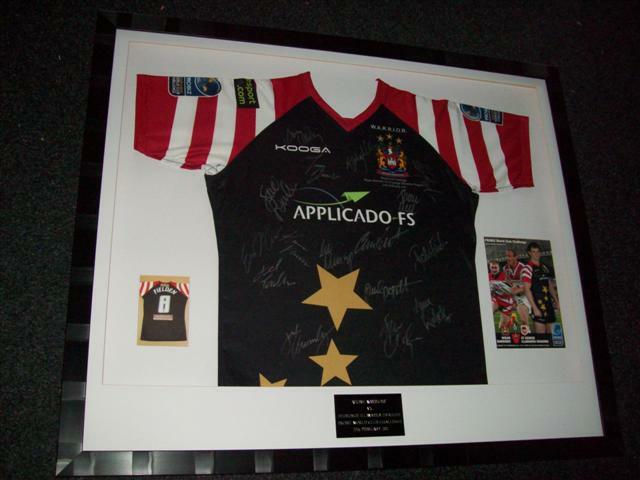 On the subject of glass we receive enquiries as to the most suitable glazing to stop signatures on shirts fading. Fading of signatures and fabric cannot be stopped irrespective of the glazing utilised, it can only be slowed down. UV protective glazing which filters out a lot of the rays that may contribute to fading is available, but is also extremely expensive. 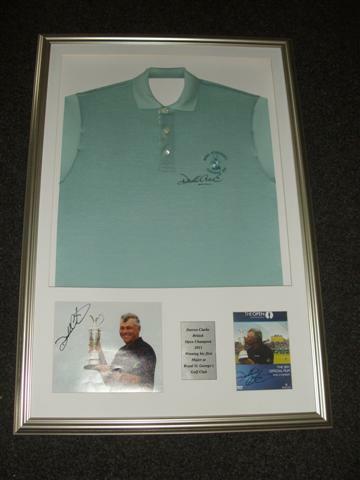 It is advisable to keep your framed shirt out of direct sunlight in order to obviate the possibility of premature fading of signatures. 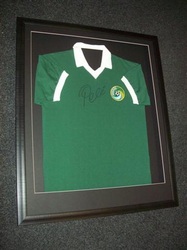 To demonstrate that there are many factors as well as direct light that can cause fading,remember that football shirts are generally volume produced with maybe not the highest nor most expensive quality cottons, and then signed by a player using a cheap felt tip type pen. 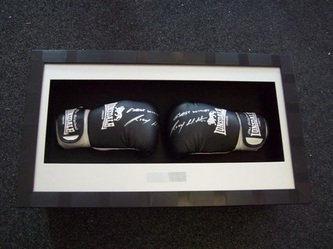 Put the two together and you do not have the best medium upon which to obtain and keep a steadfast colourfast long lasting signature. Remember those cards you may have received years ago, or that electronic till receipt that you may have kept out of the light and locked safely in a drawer - well take a look now and you may well find that the ink has faded or even disappeared! This is because there are many other factors apart from direct sunlight that can contribute to fading, such as heat, humidity, cold, damp and air pollution. 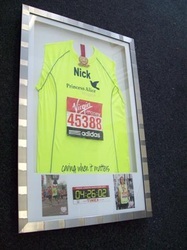 Standard safety glazing actually has more UV protection than standard glass, although is not specifically UV protective. 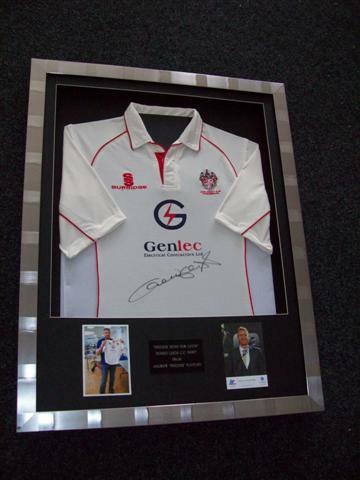 We frame many shirts utilising standard safety glazing, which is contrary to popular belief more expensive than standard glass. 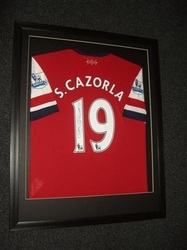 Further it needs no explanation that safety glazing by its very name is a safer option. 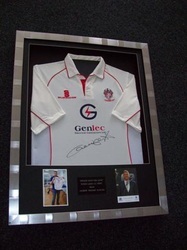 Should you specifically require UV protection glazing please do ask us as we can also supply your shirt framed with this option at extra cost. Additionally it is worth noting, and this is pretty simple cost free advice, should you wish to slow down the fading process, irrespective of whether your framed shirt has UV protection glazing or not, simply cover your framed shirt when you are not at home viewing your treasured piece. 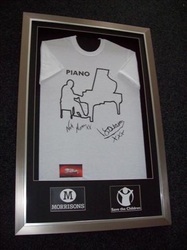 Its what museums do...!!! We do not have bronze or silver or gold or platinum or standard or deluxe levels,as all our shirts are framed exactly the same whatever you pay.We frame all our shirts to the same "platinum deluxe" standard. 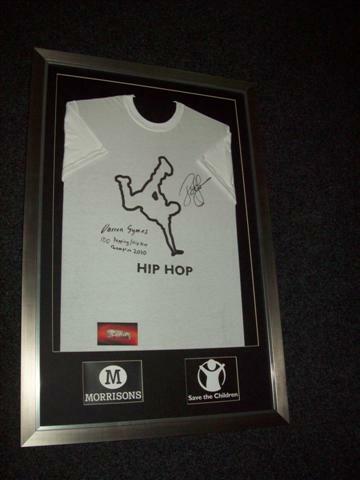 All shirts are framed using reversible techniques,which means simply that your shirt is undamaged and well protected. 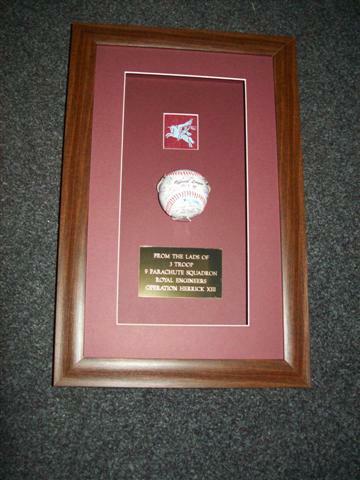 This is general conservation level, which is the standard to which we adhere. 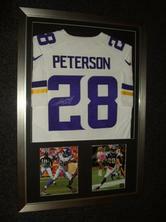 All sport shirts framed are framed to this standard regardless. 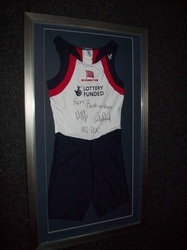 We do not charge less to frame to a lower standard or more to frame to a higher standard. 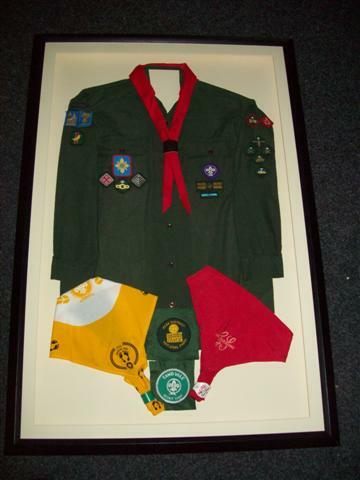 All our shirts are framed the same way regardless. 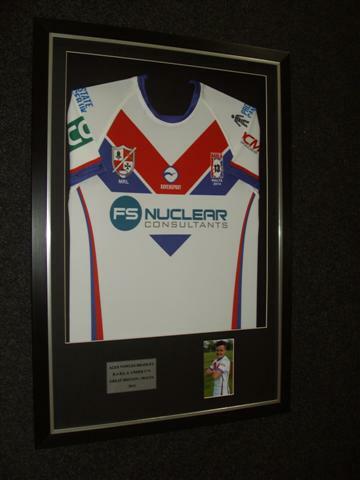 We have a large selection of frame colours and designs from which to choose along with a selection of mount card colours for your shirt framing. 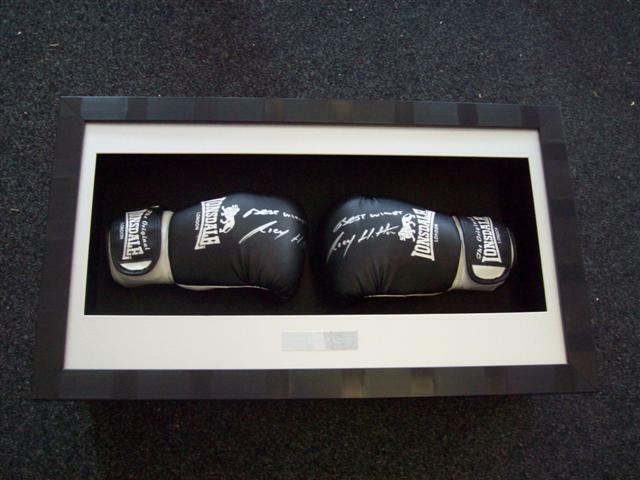 If you live or work in Blackpool or anywhere in the Fylde FY postal code area we offer a free collection and delivery once completed service. 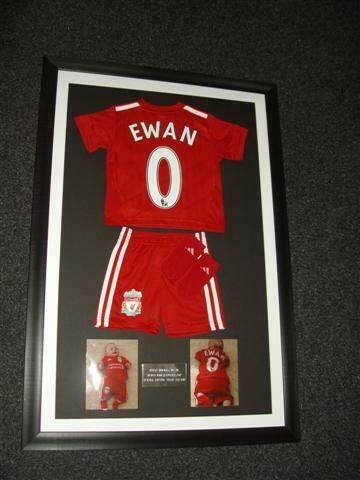 Efficient Friendly 'Real Person' Ordering Process Simply decide which arrangement style frame design front mount colour and rear background colour you like then email your requirements/instruction and we shall contact you to confirm. 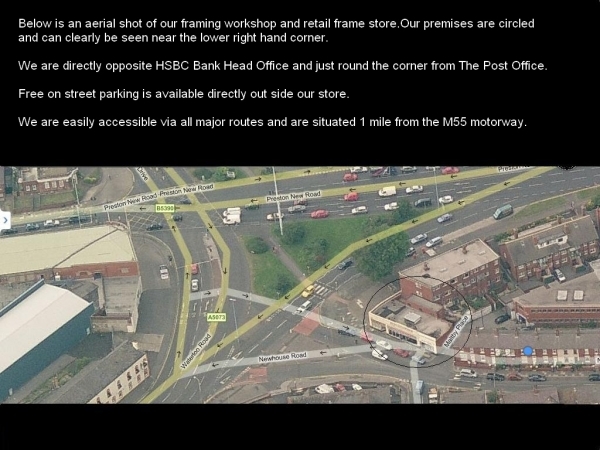 Our Fast Response Email Team are happy to answer any questions you may have. 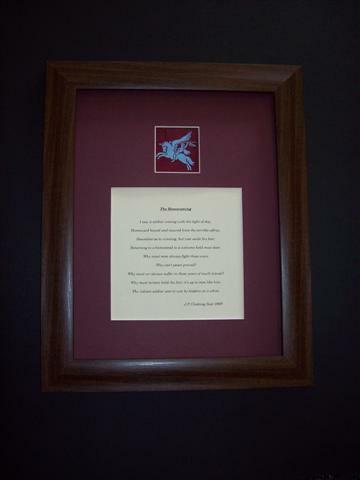 We shall contact you again when we receive them. 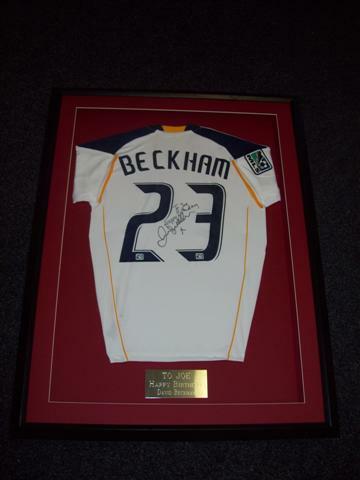 We shall frame your football or sports shirt in accordance with your instruction and notify you once complete and ready for collection. 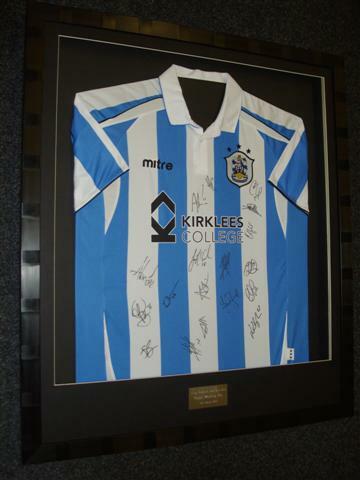 We aim to complete all football shirt framing within 14 working days of receipt of your shirt. However due to to the fantastic prices we offer and the personal nature of shirt framing and specific customer requirement it may take longer. 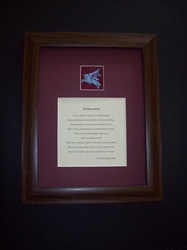 Should you have a specific date in mind for the completion of your framing, please do advise. Question: OK I have read everything now, I have all the information I need and have decided I want you to frame my shirts although how much is this all going to cost me? 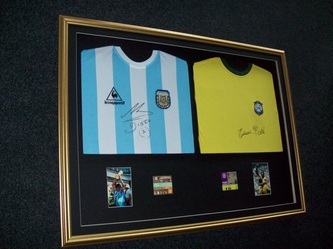 Answer: Having your shirt framed is not a cost! 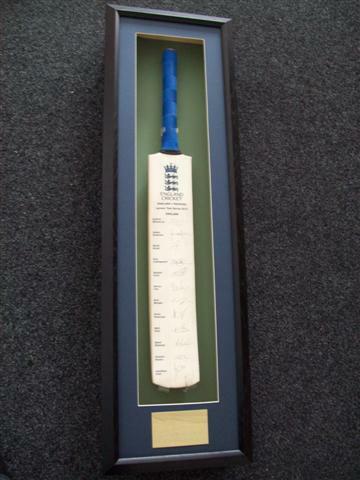 Its an investment. Remember, a framed football shirt can be worth many hundreds, if not thousands of pounds depending upon the player. 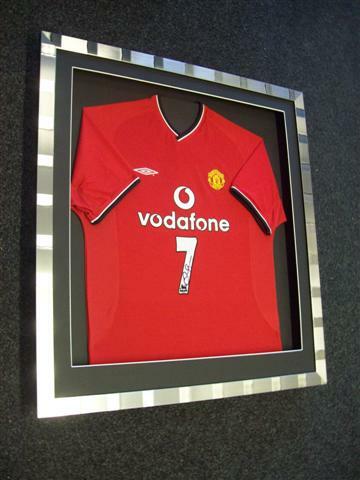 Ok, so what is your investment to frame your sports shirt when you use our football shirt framing service? 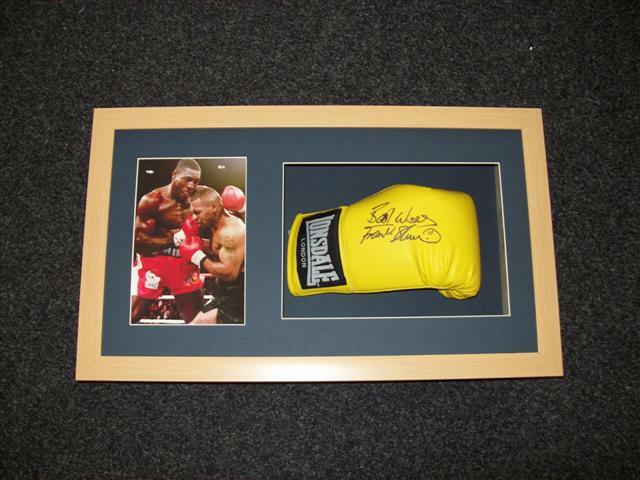 Your investment of just £109-00 for this service provides you with your choice of frame style, your choice of mount card colours, and your choice of arrangement styles pictured on our website. 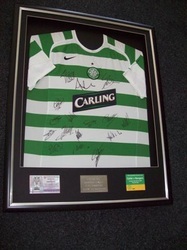 You may include up to 4 additional items such as your team photographs, ticket stubs, match programmes, COA. 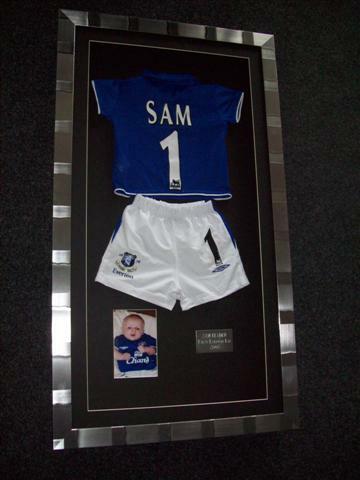 We can also manufacture an engraved silver or gold metal plaque for you, which can be included in the shadow box framed football shirt for no extra cost! 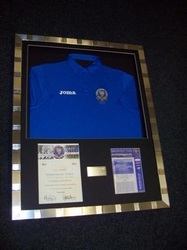 To make things even better and even easier for you we have provided a button for you to click below which takes you directly to any sports shirt framing offers and promotions we are currently running. 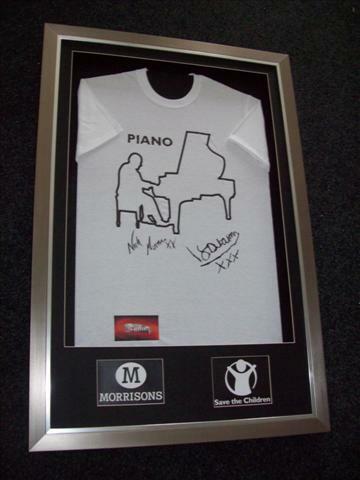 Brilliant eh? I am THE Button - Click me! If you would like to have 2 football shirts framed together in the same frame your investment is only £159-00. 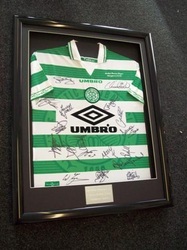 For this you may have 2 shirts framed together in 1 frame along with up to 4 extra items you may wish to include such as your COA, ticket stubs, match programmes etc. So if you are intending having your football shirt framed, for that professional look and a great service contact us NOW! 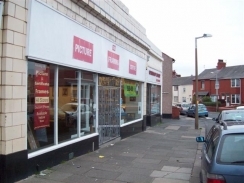 And remember, you are always more than welcome to call in to the shop at The Picture Framing Centre 4 Newhouse Road Blackpool Lancashire FY4 4BY to see us and discuss your framing requirements if you prefer. 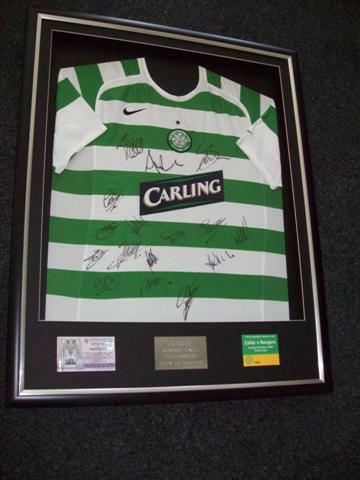 Please mention the shirt framing offer you have seen online when you visit us. 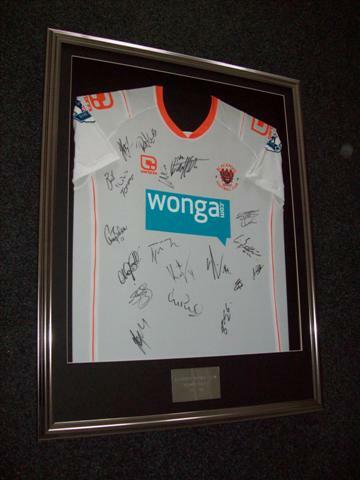 Click here to see our latest money saving shirt framing offer for customers who wish to call and collect all framing orders. 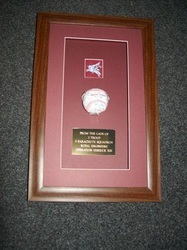 Setting The Standard For Others To Follow - Better For Less. Simple. Job Done - We Challenge You To Buy Better For Less!